After x-rays & blood tests last week, I brought Princess Sparkle to the vet early in the morning for luxating patella surgery. 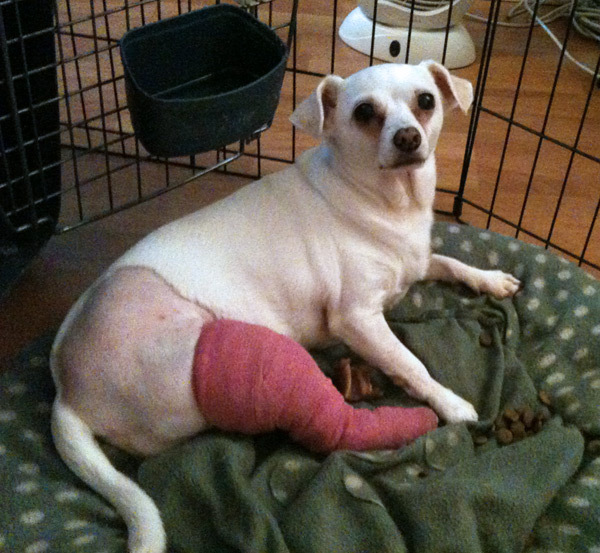 (If you missed the first part, click here to read more details about luxating patella in dogs.) She wasn’t allowed to eat or drink anything after midnight. I tried not to cry when I dropped her off, but it was a very long day waiting to hear news about how the surgery went. 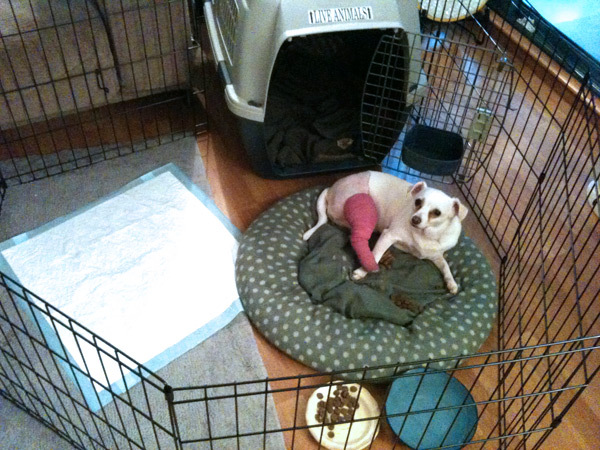 Fortunately I had lots to do to get my apartment ready for her recovery. Her activity is severely restricted for the first few weeks, which means I have to carry her outside to go to the bathroom 3 times a day, carry her back in & that’s it. She really shouldn’t be walking around at all until the leg has more time to heal. I knew this would be tough because she wants to be with me all the time. 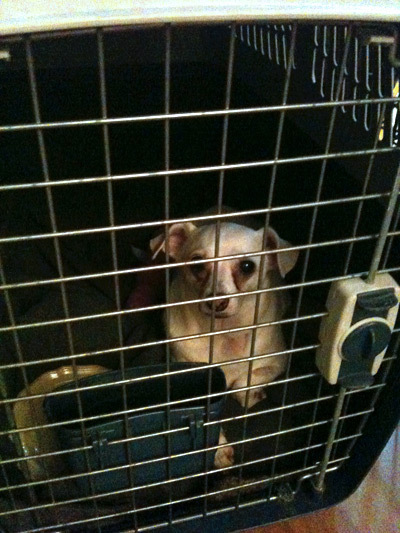 Locking her in a kennel where she cries & whines & claws at the metal gate? That’s not really the healing energy I think she’s going to need. So I bought a metal pen & set it up in the living room with her kennel inside, a pee pad (just in case) plus her food, water & lots of chew toys to keep her busy. The vet finally called around 5pm & said that the surgery went well, but that she was probably better off staying overnight with them. As much as I wanted to see her, I would have to wait until the next morning. Picking her up from the vet, I brought a soft inflatable cone so she wouldn’t lick or bite at her incision. It was so bandaged up that the cone wasn’t needed, but I wasn’t quite prepared to see her leg shaved all the way up her hindquarters. She has a little patch shaved on her front paw where the IV went in, plus another one on her neck from where they did the blood work last week. Still, she manages to shed ALL OVER my house! All in all, she’s doing OK. She hates being in the pen. The pug circles the pen constantly because he wants to get at her food. If I leave the house at all, she barks. But she seems remarkably fine! I think her leg is bandaged so well that it’s actually quite sturdy. In fact, she wants to walk & run, though I’m on strict instructions not to let that happen. So I carry her outside to pee, then carry her back inside. Then I take the pug out separately. Oh, the things we do for our pets! With the amount of days I’ve needed to take off work to care for Sparkle, plus her vet bills, I’m going to be running a sale on everything in my Etsy shop. Prints will be 2 for 1 & all lockets will be 25% off. Stay tuned for more details! Next postSave the Princess SALE!